The importance of wearing the right footwear when hiking, walking or climbing in nature cannot be underestimated. With the Dachstein range of mountaineering and alpine footwear, you can trust that you have one of the world’s leading footwear manufacturers on your side, no matter how extreme the conditions or terrain is underfoot. Whether you are hiking, climbing, running or walking, Dachstein boots and shoes incorporate style, innovation and functionality to ensure that you have the optimum experience on all your adventures. 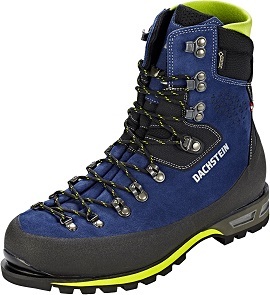 Since 1925, the Dachstein brand has been responsible for engineering unique and innovative footwear for the trekking, mountaineering and alpine industry. Behind every product is a team of outdoor enthusiasts and athletes, who are passionate about an active sporting lifestyle and therefore really understand the needs of their customers. Combining the reliability of traditional Austrian shoe manufacturing craftsmanship with cutting-edge innovation, Dachstein creates shoes that are not only extremely comfortable and robust, but that also feature the latest technology to help their customers go even further. For Dachstein, mountaineering is not just a sport or competition, it is a philosophy and a way of life. Whether you are taking a stroll in the mountains or pushing your climbing to the absolute limit, Dachstein is committed to manufacturing shoes that offer you the perfect fit, using only the highest quality materials as well as premium craftsmanship, innovation, functionality and style.